Standard clearance machine for small fields necessitated the need for common model nomenclature. Lindsay's "new kid in town" isn't as large as its brothers, but the Zimmatic 7500 is a standard clearance machine designed for small, irregularly-shaped fields and features years of Lindsay design work in a significantly redesigned piece of equipment. 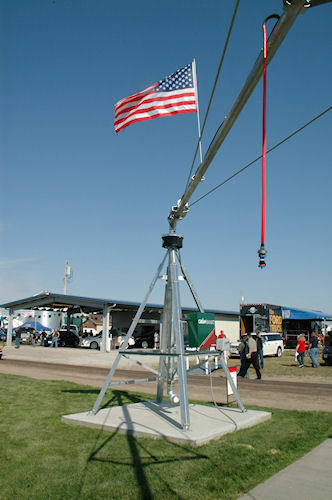 Fed by a five-inch riser, the 7500 can run up to 870 feet of 11-gauge galvanized irrigation spans from a 12' 10" pivot. With the coming of the new compact model, Lindsay realized it needed to simplify its model roster of named machines, so older named models have become the 9500 Series and 8500 Series. Lindsay's Zimmatic 7500 Series is a standard clearance machine designed specifically for fields up to 60 acres. Using traditional Zimmatic design approaches, the new machine includes significant new engineering to provide the 10' 5" field height in a package that is flexible for smaller, irregularly-shaped fields. The Zimmatic 9500 is Lindsay's toughest, most durable model designed for the most extreme geography and farming environments with pivot point heights ranging from 12' 10" to 23' 6" fed by risers up to 10" in diameter. The 9500's pipe thickness is 11-gauge and can be galvanized, stainless, aluminum or poly-lined. The 8500 Series is a lighter full-size machine with 12-gauge galvanized pipeline and a reputation for longevity and value in the field. For more on the new Zimmatic models, visit www.lindsay.com.